Isak is a "red" border collie, and was born some time around 1993 if I remember correctly. She was named after the Danish author Isak Dinesen (she wrote "Out of Africa" amongst other things). When she was a pup I spent a lot of time training her, so now she is well behaved and doesn't bark all night, except at intruders. She knows quite a few tricks, like heel, sit, "go for a run", "cross the road" and "go for a swim". If she is doing something bad (like biting children) then "naughty" normally does the trick. She can also ride pillion on my motorcycle. The photo above is of her & I (I'm the one on the right - just out of bed by the look of it) when she was about 2 or 3. We are in Mum & Dad's front yard (hence the ladder?! ), where she lives now. My friends say that she is on permanent holiday there because Dad has a soft spot for her and feeds her lots of tasty delicacies. She gets plenty of exercise with daily walks around the block, and in the nature reserve across the road from the house. 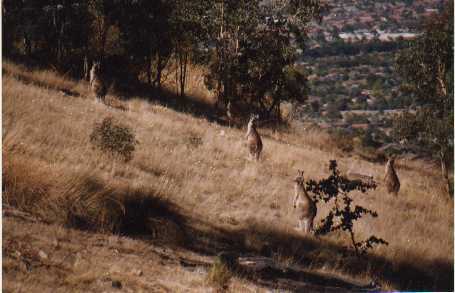 There are Kangaroos in the reserve, so I bet she is just thinking "If only I could run off and round those things up...". Update: Jan '06 - RIP Isak. May you rest peacefully, chasing sheep and kangaroos, in the big paddock in the sky. You were truly a great companion and I shall always miss you. I've been a pretty keen fisherman since before I can remember. These days I like to fly fish around the rivers in southern Ontario for trout (particularly around here), and swoff (saltwater fly fish) with my friends Jacko and Pauly back in Australia when I get home. 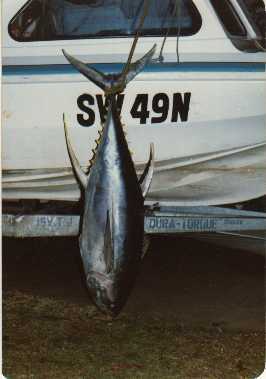 This is a picture of a Yellowfin Tuna caught off Batemans Bay. The boat in the background was called Delta-T (Dad's initials). This amazing looking fish is called a flathead or "flattie" for short. They lie on the sandy bottom with just their eyes sticking out waiting for tasty morsels to go past. This unlucky specimen one took a fly that was cunningly tied by Jacko. 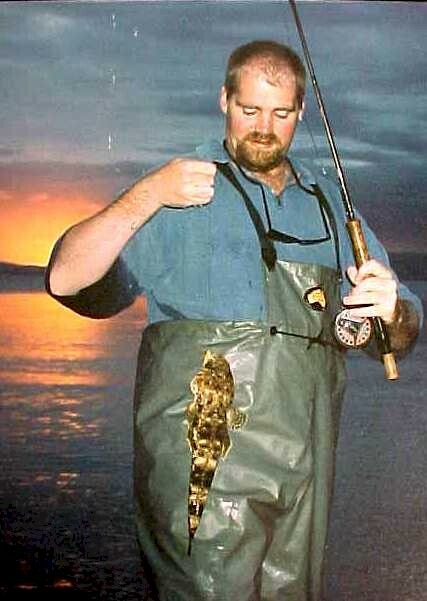 It was caught in Tasmania in summer, when the flatties tend to get lazy. In fact, the water is so clear and the fish so lazy that you can pretty well wade up to them and set the hook in their lips yourself. In case you are wondering, yes that is the sunset in the background - Tasmania is truly a beautiful place. Here's another brace of pelagics. These were caught in Mossy Point (near Bateman's Bay) on the south coast of NSW (here's a map), around Easter, 1979 (I was 14) I believe. 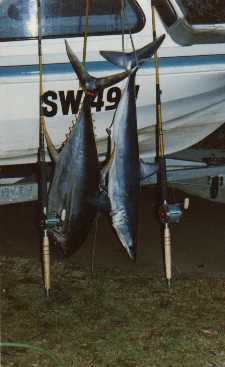 The one on the left is a Yellowfin tuna around 60Kg and the one on the right is a Mako shark around 35Kg. I remember it was a Friday night and we had just got down to the coast after the 1.5 hour drive from Canberra. There was absolutely no wind whatsoever and we were about four miles offshore. The 'fin took about an hour to pull in. When we got back to Canberrra the local newspaper took a photo which ended up in Monday's edition. We carved up the fish and gave it to Marymead - a hospital for intellectually disabled kids. This would have kept them in fish pie for about six months I reckon. I love music and have had the pleasure of playing in a couple of pretty good bands (IMHO) over the last few years. Unfortunately with travel and career I haven't been able to spend as much time as I would have liked playing - but that's changing! 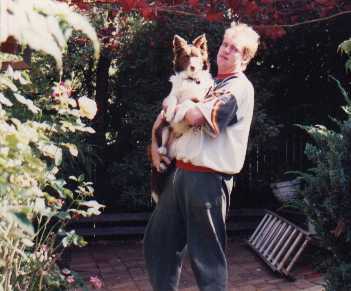 This picky is of the Kelly Gang - 1988ish. That's Jacko on the left playing bass, and Kate playing Drums. Jacko & I went on to bigger and better things (Kate probably did as well but I'm not in touch with her anymore). 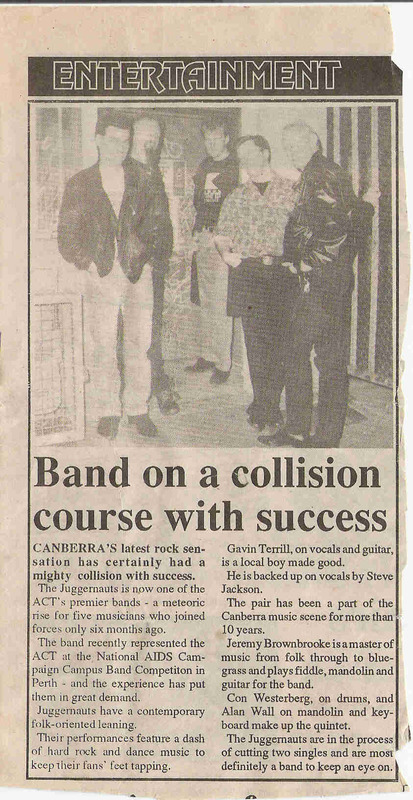 The most succesfull band we played in was "the Juggernauts" (newspaper clipping) - won a national band comp, got played on the radio a bit then promptly split up! I sing and play the guitar. Lately I've been getting more interested in fingerstyle guitar playing. I got bitten by the travel bug in my early twenties and am still going strong. 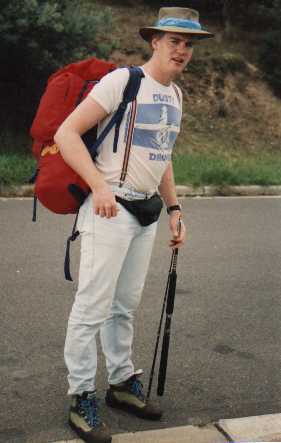 Here is a picture of me about to go to Europe the first time - circa 1990. I've been to most parts of Europe and North America, working in London, New York and Toronto. When I lived in London I made some good friends - Steve, Kim, Nicky and Mike. When they get a page up I'll put in a link. Those with a discerning eye may notice I've got the trusty fishing rod with me. 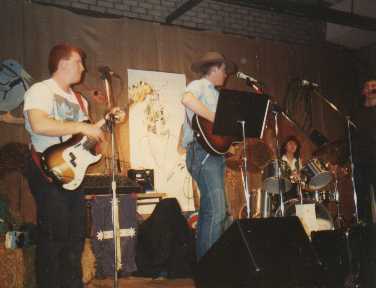 The t-shirt says "Dusty Drovers" - one of the first bands I played with. Here is my GPZ 1100. 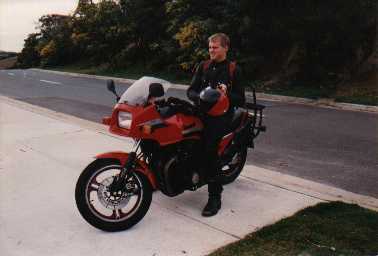 I used to ride it to Melbourne and Sydney pretty regularly. I have a Honda VF 500 sitting under the house in Canberra right now. 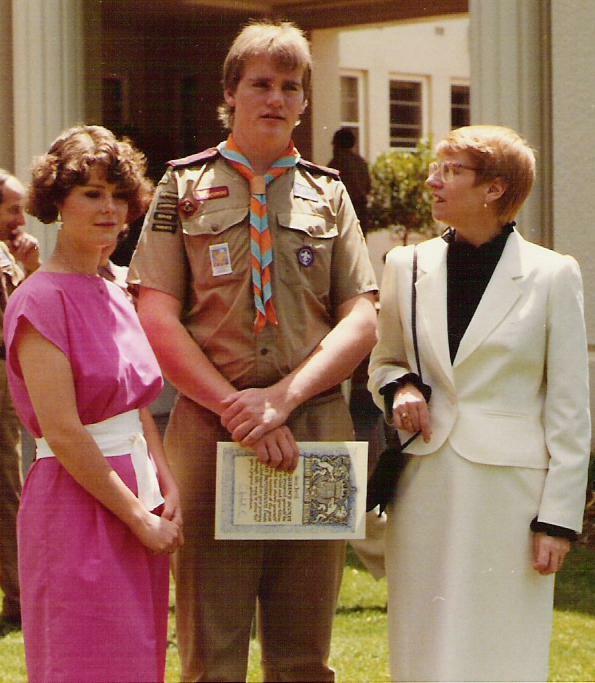 I joined the scouting movement at 14 and ended up getting my Queens' Scout award. This is a picky of me with Mum on my right and Jan (my girlfriend at the time) on the left hobnobbing it at the Governor General's House just after receiving the award.